Former NBC host Billy Bush sat down with Stephen Colbert in his first public appearance since being fired over a year ago. Bush condemned President Trump for reportedly claiming that the voice on the infamous “Access Hollywood” tape isn’t his. 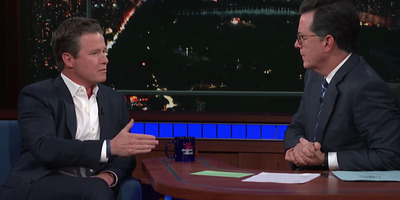 Former NBC host Billy Bush made his first late-night appearance since being fired over a year ago, chatting with Stephen Colbert on “The Late Show” Monday night. Bush said that when he was filming the “Access Hollywood” segment with Trump back in 2005, he was unaware that there was any truth to what he was saying, and assumed that he was just putting on a “crass stand-up act” for him and his crew. “If I had thought there was a man detailing a sexual assault strategy to me, I would have called the F.B.I., not just reported it to my executive producer,” Bush said. Bush also brought up the women who have accused Trump of sexual assault. “As I read these I said 20 women don’t get together and say, ‘You know what would be fun? Let’s take down a powerful guy together.’ No, they don’t. [Trump is] opening wounds on them, too. Enough’s enough. Stop playing around with people’s lives,” said Bush. In addition to speaking with Colbert, Bush also wrote an op-ed in The New York Times on Monday, condemning Trump for his reported comments on the authenticity of the “Access Hollywood” tape.